Welcome to Sea & Sand villa. The perfect choice for your family holidays up to 14 people,anniversary celebration or wedding event. Outstanding location in Santorini, Private pool, complimentary private transfer, large courtyard with garden and sundeck, perfect for families & couples. A 2-storeyed charming fully-furnished villa in Akrotiri of Santorini offering stunning caldera views,is easily accessible to all photo-worthy landmarks! Stunning beauty, private pool, large courtyard with garden, suitable for romantic couples and families. Your ideal accommodation in Santorini for your family holidays! Choose Sea & Sand luxury villas for your accommodation and enjoy the romantic Santorini scenery ! Traditional house with private balcony offering stunning sunset views. Private hydro-massage spa and shared pool. Quiet location, near to the beach. Decorously-furnished villa with splendid views. Private hydro-massage spa and shared pool. Tranquil setting located only four hundred metres from the village. Traditional and elegant house with private balcony offering stunning views. Own hydro-massage spa and shared pool. Peaceful yet located only four hundred metres from the village. This 3 bedroom villa with swimming pool is located in Emporio and sleeps 7 people. It has WiFi, a garden and garage. This 4 bedroom villa with swimming pool is located in Emporio and sleeps 10 people. It has WiFi, a garden and garage. Villa with breath-taking view of the sunset. Excellent luxurious, private accommodation, including outdoor heated hydro-massage, swimming pool and outdoor fire pit. A sea front Cycladic villa, this three-bedroom home on the eastern coast of Santorini is perfectly located to take advantage of all the island has to show. Large swimming pool with many sun loungers ! Villa Michaela has a fabulous location in the small town of Akrotiri, close to a range of amenities while the capital Fira is only a short car journey away. 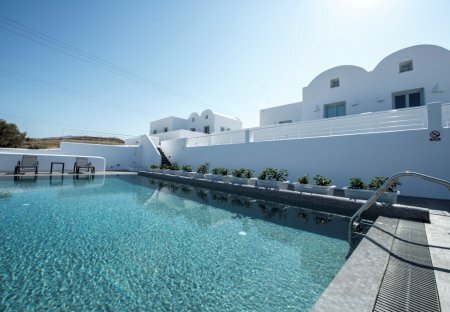 This 6 bedroom villa with swimming pool is located in Santorini and sleeps 14 people. It has WiFi, parking nearby and air conditioning. Villa Picasso has a fabulous location in the village of Imerovigli, just a five minutes' drive from the islands capital Fira which boasts a range of amenities, cosmopolitan bars and shops. This 4 bedroom villa with swimming pool is located in Santorini and sleeps 10 people. It has WiFi, parking nearby and air conditioning. Modern and new, a one bedroom apartment with balcony offering lovely sea views. Only a short drive from the centre of town.